The only way I could think of to do this problem is reductio, but since the two biconditional terms are not contradictory, I am pretty stuck. 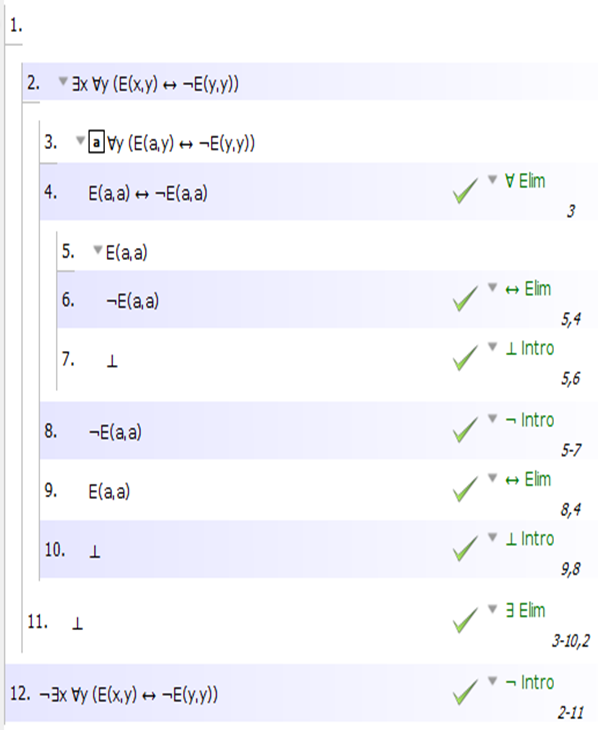 E(x,y) <-> ¬ E(y,y) is clearly false if x and y are the same, because then the statement becomes E(x,x) <-> ¬ E(x,x). Whatever we choose for x, E(x,y) <-> ¬ E(y,y) is not true for all y, because it is not true for y = x. Here is a proof using the law of excluded middle. After eliminating the existential quantifier to get x, apply the universal quantification on x itself to get E(x,x) ↔ ¬E(x,x). This is false if E(x,x) is true or false. Variable P : Prop -> Prop -> Prop. Axiom LEM : forall p, p \/ ~p. 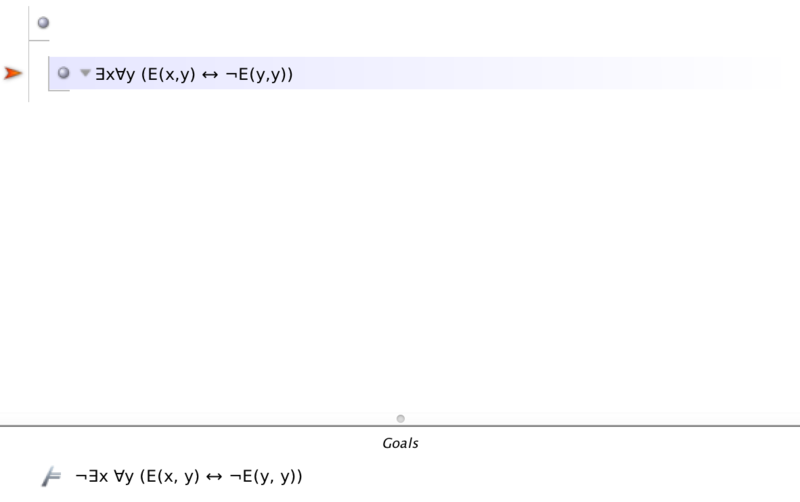 Goal ~exists x, forall y, (P x y -> ~P y y) /\ (~P y y -> P x y). assert (P x x \/ ~P x x) by apply LEM. apply H0 with x; assumption. apply H0 with x; apply H0; assumption. Not the answer you're looking for? Browse other questions tagged logic proof fitch or ask your own question. Is there an unambiguous way to state the biconditional in everyday language? How to show -(P -> -Q) ⊢ P&Q? How does one prove ‘(B→C)→¬A’ from ‘(A→B)∨C’ and ‘(A→¬C)’ in Fitch?